Commercials generally aren’t known for originality. Fake-friendly voiceovers, dancing fruit, goldfish with personalities – it can all become a little tedious after outgrowing the glorious life stage during which anything could be funny if it tried hard enough (or not at all). 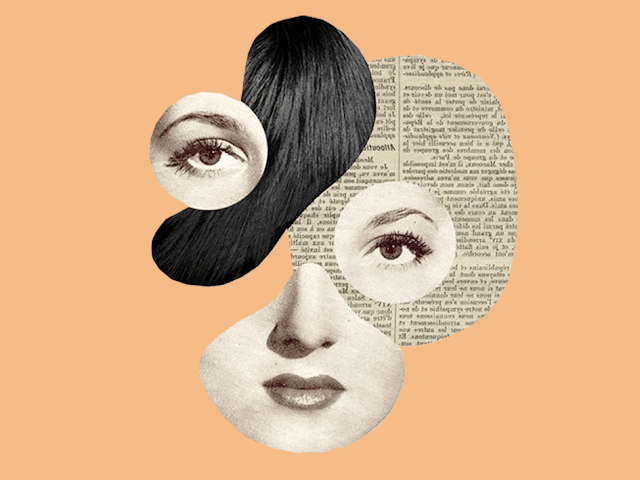 The average advertisement is met by adults with bored scepticism, or utter indifference. The new commercial for Kenzo Parfums by Spike Jonze, however, can be met with neither. Indeed, ‘average’ is nowhere in sight (and no, I do not work for Kenzo). In short, the video revolves around a young woman named Margaret (played by Margaret Qualley) who is attending an awards ceremony. She’s seated, listening; laughing and clapping at the right moments. Yet all of a sudden, she gets up discreetly and leaves the room. Once outside, she stands in the empty hallway looking rather miserable, and growing a little teary. And then… she lets loose. You don’t need me to summarise a video. Go and watch it; it’s fun and subversive and really quite brilliant. It can also be enjoyed at face value – and indeed, maybe that’s how it should be enjoyed. Not everything has to have meaning. …If you are curious about what it might mean, however – especially considering how one’s reaction to such a video may well be “what did I just watch?” – here are some ideas to chew over while you simultaneously ruminate on whether you can get away with similar behaviour at your next conference. To begin with, how does Kenzo describe what it has spawned? “KENZO's artistic directors Carol Lim and Humberto Leon breathe their vision of fashion into their first fragrance. A world in their image: bold, spontaneous, surprising, fun, colorful… A world that celebrates freedom of expression, diversity and creativity. A playful and dynamic fragrance...true to the KENZO spirit. So far, so simple. Kenzo wants to show that it is inventive, modern, empowering, and also to give a nod to feminism, which is currently widely discussed and rather trendy – it certainly snags headlines, at any rate. Granted, Kenzo never uses the dreaded term ‘feminism’ itself, but it’s still playing in that ballpark. Upon first viewing, however, it may not be entirely obvious how that message aligns with a video in which a young woman runs around as though she is either possessed, or has just imbibed a can of condensed Sia videos which has been shaken too hard. Firstly, in classic talking-about-women-in-the-media style (such aspirations), let’s talk about the dress Margaret is wearing. Note the ‘X’ design over her chest: everything about it screams being bound, being restricted. As for the colour, the choice of green is an interesting one. It’s not a common dress colour, and that in itself puts the wearer apart from those around her and implies that she is bold and unconventional. (For another example of this, think of Keira Knightley in Atonement). Furthermore, being traditionally representative of envy, green’s ‘green-eyed monster’ connotations could be coming into play here as a means of making Margaret appear even more ‘unstable’, or at least unpredictable to the viewer. Green is also regularly associated with magic and eerie mystery in film – think flashes of green light – as well as sexual power and menace à la ‘snake lady’. As for other costuming, pay particular attention to the very tight bracelet on her arm, and to the fact that Spike Jonze specifically shows us this bracelet as Margaret wipes away tears. Why did he choose to show us this? Because the bracelet is representative of a wealthy sort of entrapment; a gilded cage (arguably that of social expectations), if you will. Needless to say, the video is subverting the tedium of ordinary perfume commercials with marked zest. Instead of some banal plotline about a perfectly-groomed celebrity wafting through a minimalist apartment and out to a sports car driven by a man wearing a Rolex, we get a combination of Jurassic Park and The Exorcist. Margaret uses her hand to mimic being talked at. She then bites down on it, hard. Insane? Hungry? Not at all: she’s really just sending a big “F*** you” message to people telling her what to do and how to behave – or indeed, laying down rules on how to be feminine in general, if the Kenzo statement is anything to go by. As for the dancing with her reflection, this shot is representative of – you guessed it – another middle finger to societal expectations of what this girl should look like and how she should behave. The ridiculous dance moves also deride these expectations in a playful manner, and demonstrate Margaret’s embracing of her own individuality. The statue segment is cute. It arguably reflects a heightened version of real conversations or conflicts (especially male-female ones, bringing in the ‘performance of gender’ angle): two people face to face, smiling; looking shocked; offended; angry – and then a cheeky “no-I-was-only-playing” lick at the end. It’s provocative and performative, and thus plays up the socially performative rendering of people’s emotions when they converse. Very expressive. Again, this is about performance. The girl is at an awards ceremony and feels very uncomfortable; the whole video is about watching, and the pressure of being watched, and about how one performs when under scrutiny as opposed to when alone. The above shot challenges the viewer to question their own perceptions. Nice work, Jonze. A vase is an ornament; it is pretty; it can hold flowers; and viewing it from a Freudian perspective (argh, why), its rounded shape is reminiscent of the female form. So essentially, Margaret zaps a vase to show her distaste for her constricting and performative gender role – and then the video positions her as a vase against the tapestry, constrained by the space of two pillars (Freud: “Phallic shapes! Representative of men!” Shut up, Freud). Naturally, try as she might to perform within her role on the podium – we see her smiling nervously at the camera – Margaret cannot contain herself; it’s too constricting. She ends up dancing awkwardly out of the frame, half playfully, and half as though she’s trying to save face. This is followed by a segment in which she stars in her own spotlight, dancing for nobody but herself. Not hard to see the symbolism there. Note, however, how she makes strong ‘pushing away’ motions before she decides to dance, on her own terms, in an extremely traditional feminine manner. In case that reading strikes you as a little too in-depth for a perfume commercial though, fear not: we are now back to dinosaur dancing. Margaret has escaped from the conference building, incarnating the dreams of bored female businesswomen everywhere. But wait! What is that monstrosity looming before her? 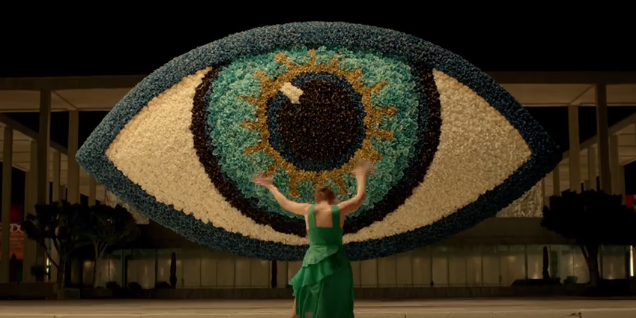 That would be a giant floating eye made of flowers, because perfume commercials. In seriousness though (because this is clearly all very serious), there is a lot of symbolism going on here. Margaret runs up to the front of the eye and beats her chest and whatnot, because she is physically intimidating this ultimate symbol of the judgemental gaze, and the consequent obligation to conform. She’s responding to the video’s ongoing motif of eyes and mirrors; the video’s message has reached its crux, and Margaret is challenging the views which constrain her. She then busts through the eye’s pupil and lands on the other side amidst scattered flowers. Why? For starters, flowers are a recurrent motif in the video – they’re literally everywhere, and Margaret is even shown contemplating them in the video’s very first frame. This is because they’re representative of femininity as well as bouquets at awards ceremonies, which a person is awarded if they perform their role well. It’s therefore highly significant that she sends them flying. Then when she stands, the video positions her in the place of the pupil, making her the centre of the eye. In this sense, the person she truly is has become visible (thanks to Kenzo perfume, I suppose), and has occupied a space within the gaze of those who would seek to see her only within the limitations of the role which they’ve delineated for her. It’s also a nice play on the saying ‘Beauty is in the eye of the beholder’. She’s literally in the eye now – what are you going to do about it? In conclusion, I don’t know whether this commercial will help Kenzo sell more perfume, but then again, I never promised to answer such questions – I’m not a Wall Street broker. Still, no matter: I’m sure the numbers will be out there soon, if they interest you. Cross your fingers for more lasers. Dream big.